TRICOR Packaging & Logistics AG is market leader in heavy-duty corrugated board packaging in Germany and is specialized in the areas of packaging technology, design, production, logistics and servicing concerning packaging processes. With highly sophisticated, slim production processes, which are centrally connected, the company meets the demands of the continuously increasing service demands of the industry as system supplier, full-range provider and logistician. With the build of their new headquarters in Bad Wörishofen, Allgäu, Europes‘ most powerful corrugated-board and logistic industrial park was created on 130.000 square meters with a second-level area of 66.500 meters. For the newly built plant in the headquarters a concept for a high-bay warehouse was sought, that would enable a flexible flow of material as well as a storage concept. Additionally, information about dimensions, shape and orientation of a packaging stack should be collected and evaluated. This data is especially important since it is a fully automized high-bay warehouse. Next to heavy-duty corrugated board stacks without a pallet, euro pallets and special pallets are also transported to the high-bay warehouse and must precisely fit onto the tracks inside the warehouse. „This is the reason why we needed the high precision between 1 and two centimeters with regards to length, width and height. Even the position of the pallet underneath the heavy-duty corrugated board must be precisely determined. 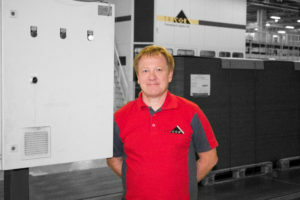 The system has to detect the precise dimensions and transfer those to the higher system.“, explains Klaus Peter Weidenhaupt, responsible for the area of intra-logistics and energy management at TRICOR Packaging & Logistics AG. During the planning stages of the plants renovation he contacted AKL-tec since both companies had already met at a trade show. Next to the precision of the data the specification sheet demanded a thorough measurement portfolio since the system needed to detect numerous types of loading units. The own heavy-duty corrugated board device is connected to the high-bay warehouse through a conveyor system and raw product needs to be measured while passing through. After storage, the product should be transported out of the warehouse automatically and brought to packaging and then be placed on pallets and strapped. What follows is another measurement to gather dimensional data and the storage inside the warehouse and finally the loading onto a truck. „ We needed a system, which would detect raw product without a pallet and the final product with a pallet. Furthermore, the system needed to handle the six to seven thousand daily movements the warehouse delivers.“, states Weidenhaupt. Die demanded needs are met with our seven APACHE conveyor systems with the additional horizontal scan of the sub-pallet from AKL-tec. APACHE conveyor measures and detects the dimensions, volume as well as the weight of heavy-duty corrugated board stacks on-the-go. Therefore, each system is equipped with two laser scanning heads placed above 2,5 meters wide PVC conveyor systems and one laser scanner placed underneath. 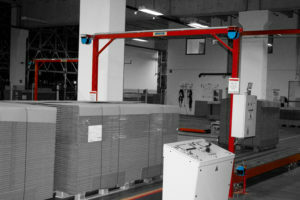 These detect the object to be measured and transfer the data to the specially designed software, which initiates the fully automated transport to the high-bay warehouse. Thanks to the precise measurement the loading units with and without a pallet can be transported fully automated and additionally the automated 3D detection of each heavy-duty corrugated board stack enables the documentation of an image of the contour data. Even the evaporation of the corrugated board at 70 degrees was an issue that created issues since the laser rays were reflected by the steam. A quick fix was a fan system which blows away the steam. „Without the APACHE system we could not operate the high-bay warehouse. Due to the high amount of storing and retrieving the manual measurement of goods is impossible and creates a high risk of error.“, says Weidenhaupt explaining his choice and adds, that it was the quickest installation period of all the systems at their plant. The company is furthermore planning another factory renovation, which is assumed to be even larger than the one in Bad Wörishofen and also requires contour checking. „The cooperation with AKL-tec was to our full satisfaction and everything was well prepared. We can only report positive things about the functionality and reliability of the system. Especially in our fully automated process we try to prevent interruptions, which we have succeeded in so far. We will definitely rely on our measuring experts for future projects and already have a small challenge for them: Configure the laser ray in such a way that it is not influenced by the steam“, summarizes Weidenhaupt grinning, but happy. Universal Express, a company member of the Ziegler Group, located in Aalst, Antwerp, Zeebrugge and at the Brussels Airport (BRU) has the perfect locations for import and export transportations, since 60 percent of the European purchasing power lies within 500 km. The direct connections to the highway, Sea and Air, provide another geographical advantage. In this way, the forwarding company is able to offer partial or full loading as well as express shipping and freight chartering in every European region within 24 or 48 hours. Even though Air and Sea freight is an inherent part of the transport solution, road haulage comprises the core business of the forwarding. Special vehicles are used here depending on the transported goods, which are suitable for hanging textiles, international moves or the transportation of trade fair and exhibition equipment. Next to these competences, the logistics sector represents another pillar of the family-owned Ziegler Group. Since its origin in 1956, Universal Express is one of the leading transport companies in Belgium – having also a logistics note to France with the subsidiary in Alast. Approximately 55 transport journeys arrive at this destination with goods of all sorts; from euro paletts to large freight goods up to five meters. Each product is distinguished by different properties and even though their measurements are given by the shipper, they are not always correct in practice. False values do not only lead to temporal but also monetary consequences, if the data is used for planning cargo and routes. In order to put an end to these disadvantages, Jean-Pierre Caignau, Head of Roadfreight and Logistics activities of Universal Express looked for a system, which provides exact data that can also be used for settlements. The professional exchange with a colleague resulted in the recommendation of the multi-dimensional measurement system APACHE of the AKL-tec GmbH. Joe Sidon, account manager of AKL-tec, presented subsequently the AKL-tec system, which convinced the Universal head executive. The automated palett characteristic detection APACHE represents an enormous relief for the employees due to its easy handling. The 5.3 long APACHE is mounted under the ceiling, enabling the forklift driver to place the shipment piece immediately after arrival under the multidimensional measurement system. The warehouse clerk only has to consider that the label strip is on the left hand side of the goods. An automated barcode reading system that is arranged as a tower, records the label after setting down the freight. The dimensioning starts as soon as the forklift truck leaves the measurement area and is implemented by means of two laser measurement heads that scan the goods three-dimensionally. Shiny or black surfaces, which are often used for packaging, do not affect the measurement. The APACHE system is type-approved as well as certified and therefore authorized for the application in legally relevant business transactions (for billing purposes). Additionally, a picture is taken of each measured object and, along with the determined data, automatically send to the mail-order company. Moreover, these numbers can be shared with Universal Express partners in France, Spain and other countries, due to the digital process. The entire process, as seen from a holistic point of view, starting with the delivery of the goods, to the planning, cargo and departure, is significantly faster and more precise than before. “Using APACHE offers decisive advantages for us: we now know the volume and dimension of the goods we transport one hundred percent. There are consequently no excuses anymore from our customers, which would justify a lower settlement price. We are able to plan the loading of the trucks more efficiently based on the data and exhaust each vehicle completely – resulting in not only an environmentally friendly transport, but also in faster shipment for our customers, since the products do not have to be transshipped. Furthermore, we are able to increase the quality as well as profitability of our business”, explains Jean-Pierre Caignau and praises additionally ALK-tec’s service. The two companies have regular contact: in case of a technical challenge, an employee of AKL-tec arrives on-site within 24 hours in order to solve the problem. Next to the operation site in Aalst, another multidimensional measurement system is applied in Gent. “We registered traceably improvements in all road transport areas and consider therefore the application of further APACHES at other locations”, concludes Jean-Pierre Caignau. The freight forwarder Rüdinger in Krautheim, Baden-Wuerttemberg, uses the freight volume measuring device Apache from AKL-tec in its transshipment warehouse. The use of this multi-dimensional measuring system, manual measuring, writing, weighing and re-recording of data and thus any transmission errors are things of the past. Apache captures all significant values ​​with millimeter accuracy and avoids sources of error. In addition, the automatic procedure brings a huge time advantage, as the delivered pallet goods can be measured, sorted and loaded directly after arrival. Not only are incorrect vehicle requirements or overloading avoided, but it also enables the transport of as much goods as possible per truck, thus ensuring an economical and environmentally friendly transport. A standard system was not suitable for Rüdinger. So much the better that AKL-tec builds each system individually, flexibly and fully customizable for the customer. For the purpose of measuring, the cargo, which can be up to 5 m long, 2.5 m wide and up to 2.8 m high, is positioned below the Apache system on a floor scale. Subsequently, two laser measuring heads scan the goods in three dimensions. During the measurement, a photo of the object is automatically taken and integrated into the shipment order. Within seconds, the process is completed and the weight and dimension data are reliably stored in the system. Afterwards the warehouse operators can use a barcode to obtain precise information regarding the dimension and the further transport route. “Since we work with the Apache, we can not only load our trucks optimally, but also operate more economically. In addition, delayed departures due to unpredictable difficulties of loading are avoided, “sums up the CEO Roland Rüdinger. Thanks to the Apache system, all logistic processes are carried out quickly, precisely and in the best possible way. (Alsdorf, 13.03.2017) – AKL-tec GmbH from Alsdorf / Sieg participates in the LogiMat in Stuttgart for 8th time. From March 14th -16th, the experts will present their innovative and high-precision solutions for the measurement of “logistic objects” in hall 6, stand D21. The focus is on solution-oriented and customizable systems for the determination of geometric data such as length, width and height as well as for the weight. 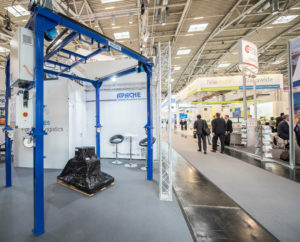 As a new product for general cargo logistics, the APACHE flying forklift system will be presented, which allows the measurement of pallet-like cargo on the forklift in transit. In addition, two new members of the CubiScan product family will be presented to show the capture of master data and the geometric measurement of parcels in shipping. “With the use of our customizable system solutions, our customers can very quickly save and earn a lot of. Sharp eyes pay off. “, says Rüdiger Elben, CEO of AKL-tec GmbH, adding that he and his colleagues are looking forward to a professional exchange with the visitors. (Alsdorf, 10/04/2017) – The AKL-tec GmbH hosted once again the Pallet Dimensioning Days. International partners took part in this year’s event at the beginning of September, which was held – fitting the event – in a technology museum. “The event is growing from year to year. This year we welcomed 45 participants from over 20 countries across the globe. We even planned an extra day in order to accommodate the broad spectrum of interesting topics”, explains Rüdiger Elben, CEO of the AKL-tec GmbH. The focus was on best-practice examples and lectures, the exchange of expertise and networking. Next to the standardized measurement solutions of AKL-tec, individualized solutions are needed, which require special know-how in the planning, realization and implementation phase. Another topic was the future of the logistics industry, in which the customer demands an ever faster delivery and that can only be met with the corresponding solution. Further, new products and the development of the ‘Global Dimensioning Alliance’ formed an important issue. The alliance, established five years ago, focusses on dimensioning systems and makes an essential contribution to the growth and the continuous development of the dimensioning market. AKL-tec GmbH is a family-run company based in Alsdorf / Sieg, whose core business comprises of measuring devices for logistic objects. With the global sale of its systems, the company has secured a leading international position in a niche segment over the years. The measuring systems from AKL-tec are used by logistics providers such as parcel services, mail-order companies, airfreight and forwarding agencies. In focus here are tailor-made solutions for the determination of geometric data such as length, width and height as well as the weight. In addition to software development for multi-sensor systems, the company offers everything. Thus, the mechanical and electro-technical construction also belong to the company’s expertise. 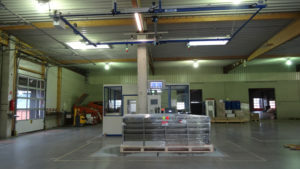 Today AKL-tec is a leading expert in the field of measuring pallet freight. The general cargo measurement is a market, that the company was not only allowed to characterize, but also had to be reinvented over and over again. To understand this, we turn back the clock more than 20 years ago. In the early nineties, the combination of a partner’s rather coincidental information, that objects can be measured with infrared scanning technology and the existing affinity for digital image processing, helped AKL-tec to develop a niche product. The small business was supported in its work by a development grant of 18,000 marks. The first prototype was designed and the innovation received the name: “APACHE”. The freight volume metre, which sounds like an Indian tribe, stands for automatic pallet characteristics detection. The first unit was purchased in 1996 for the use at Berlin Airport. In airfreight, the need for such a measuring device was obvious, as volume and weight are equally relevant in charging for freight costs. Soon after, other international customers, such as the airports in Singapore and Miami, were additional customers. The further development of the concept moved forward continuously. In 2001 a flexible and mobile measuring device was sought. The “APACHE portal movable”, which was developed in cooperation with the logistics company Dachser, met the needs of precision and adaptability for many forwarding companies. Shortly after the turn of the millennium, the European Measuring Instruments Directive (MID 2004 / 22EG now 2014/32 / EU) came into force. Since then, type examinations have been completed in almost all regions of the world for the “calibrated” use of the measuring systems. In 2005, AKL-tec joined forced with then US competitor Quantronix in order to found a strategic alliance which pooled the core competencies of both partners. Logistics takes place globally per se. For a small company, this was a Herculean task that could be shouldered with an agile network of international and regional partners by AKL-tec. 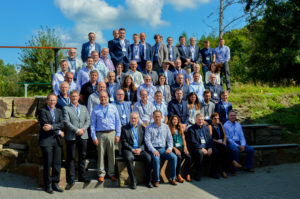 Four years ago, according to the motto “team players around the globe”, a network of manufacturers and integrators of multi-dimensional measuring instruments emerged – the Global Dimensioning Alliance (GDA). The members are characterized by a high level of service, expertise and, last but not least, by excellent access to the measuring systems of CubiScan and AKL-tec. A continuous exchange of experiences and views creates an innovative environment. Another milestone in the company’s history is the development of the “APACHE flying forklift”. The system saves time for logisticians, as the pallet is measured and weighed without stopping the forklift. The ever-increasing demand allows production to increase to several hundred measuring devices per year. Well over 1,000 installed systems are used around the globe. Using to the innovative invention of pallet measurement, logisticians and freight forwarders are able to bill the freight charges precisely. The freight forwarder Rüdinger in Krautheim, Baden-Wuerttemberg, uses the freight volume measuring device Apache from AKL-tec in its transshipment warehouse. Using to this multi-dimensional measuring system, manual measuring, writing, weighing and re-recording of data and thus any transmission errors are things of the past. Apache captures all significant values ​​with millimeter accuracy and avoids sources of error. In addition, the automatic procedure brings a huge time advantage, as the delivered pallet goods can be measured, sorted and loaded directly after arrival. Other incorrect vehicle requirements or overloading aren’t only avoided. Also, as much goods as possible can be transported per truck, thus economical and environmentally friendly transport is ensured. A standard system was not suitable for Rüdinger. So much the better that AKL-tec makes each system individually, flexibly and customized for the customer. For the purpose of measuring, the cargo, which is up to 5 m long, 2.5 m wide and up to 2.8 m high, is positioned below the Apache system on a floor scale. Subsequently, two laser measuring heads scan the goods in three dimensions. During the measurement, a photo of the object is automatically created and integrated into the shipment order. Within seconds, the process is completed and the weight and dimension data are reliably stored in the system. Afterwards the warehouse operators can use a barcode to obtain precise information regarding the dimension and the further transport route. “Since working with Apache, we can not only load our trucks optimally, but also operate more economically. In addition, delayed departures due to unpredictable difficulties of loading are avoided, “sums up the CEO Roland Rüdinger. Thanks to the Apache system, all logistic processes are carried out quickly, precisely and in the best possible way.